Thunder Snow benefited from a well-judged front-running ride from Christophe Soumillon to claim a surprise victory in the Dubai World Cup at Meydan. Saeed bin Suroor's charge had competed in each of the three rounds of this year's Al Maktoum Challenge, finishing second in round one, winning round two and suffering an odds-on reverse in round three. Although a Group One winner as a two-year-old and three-year-old, he looked to have his work cut out in the feature event of the night, but appeared much improved under more positive tactics and secured an impressive success. Soumillon allowed Thunder Snow to roll along in front from the outset, with Bob Baffert's red-hot favourite West Coast always in his slipstream. The American challenger looked poised to attack rounding the home turn, but it was soon obvious Thunder Snow had far more in the locker and he powered clear to score readily. West Coast just managed to hold on to the runner-up spot from stablemate Mubtaahij. 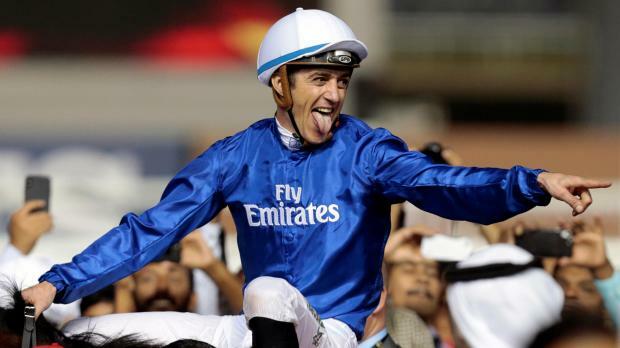 Bin Suroor was saddling his eighth World Cup winner, while it was a first for Soumillon. Bin Suroor was understandably thrilled with Thunder Snow's victory in a course-record time. He said: "The horse is really brilliant. He's a Group One winner in the past as a two-year-old and last year and now he's come back to win a Group One again - the World Cup. "I think the jockey did a brilliant job. Nobody has done that before. "He got away from stall 10 and got him handy. He took off and never looked like coming back." "After that Saeed told me to try to get the best start possible and stay close to the pace. I never thought I would be able to make the running with that draw, but he jumped quite well and on the inside I saw nobody was trying to challenge me. "West Coast let me go and when I arrived in the first corner my horse just pricked his ears and had a good blow. "In the back straight I was really cantering. He's a funny horse as he's really talented, but sometimes when it's in his head he doesn't want to do something he doesn't go. "When he wants to go, he's just amazing." He added: "I'm in heaven now, we will have a big party tonight! "He's a champion, he's proved it in Europe and now here. He's an amazing horse. "It's difficult to say just after race (where it ranks), but winning this is like a dream come to true. When I was a kid in jockey school I was looking and screaming when Cigar won. "I was hoping one day I would have that chance." West Coast's rider, Javier Castellano, made no excuses for the vanquished favourite. He said: "I was in a perfect spot and I didn't have any complaints at all. "Turning for home I thought I might be able to get to the winner, but he just moved away and was very impressive." Victor Espinoza rode Mubtaahij and felt some late interference may have cost him second. Espinoza said: "They went very slowly and he was pulling my arms out. I decided to track West Coast through, but just as I was going to move into second he (West Coast) shot me down. "I lost my momentum and but for that could have finished second."